Do you have a credit card or debit card with HFCU? 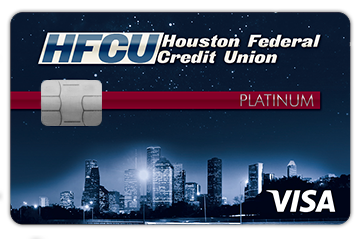 In the first quarter of 2016, we replaced magnetic stripe credit cards with chip cards. New debit cards with the chip will be replaced this summer. Here are some helpful things you should know. Q. What is a chip card, and how does it work? A. Chip cards, also called EMV (Europay, Mastercard and Visa) or smart cards, utilize a computer chip embedded in the card to generate a one-time use security code. This is the small, metallic chip you’ll see on the left side of your credit cards. When you use your card to make purchases at a business, the chip communicates with the terminal, sending this one-time code exclusive to that purchase. The code cannot be used again, making it nearly impossible for your cardholder data to be stolen and counterfeited. Q. Why are we switching to chip cards? Safety and a Higher Level of Security – Because of the one-time code generated with in-store purchases, if the data is ever stolen, it becomes useless to criminals, making it nearly impossible to develop a counterfeit card. Q. How do I know if my card is a chip card? A. Chip cards have a small, rectangular chip embedded on the front left side of the card. Your card will still have a magnetic stripe on the back so you can swipe it at merchants who are not yet equipped with chip-enabled terminals. Q. How will chip card transactions be different? A. Right now, with a magnetic stripe card, you swipe your card at a terminal. With a chip card, you’ll insert your card chip-up into the terminal, follow the prompts and wait for it to process. Also, remember to take your card with you when your transaction is complete. Q. What do I need to do when I receive my new chip credit card? A. When you receive your new card, activate it. You can quickly activate your card online. Remember to destroy your old card. Begin inserting your card instead of swiping it at any merchants’ payment terminals that accept chip cards. Update your credit card number with bill pay and recurring payment services such as health club memberships, school tuition, etc. Q. What happens if I need to return an item purchased with my magnetic stripe credit card, and my new chip card is activated? A. If you return a purchase made on your previous credit card, your refund will automatically be credited to your account even though your card number has changed. Q. What if I have reservations booked with my magnetic stripe credit card and my new chip card is currently activated? A. If you made reservations with your magnetic stripe credit card, merchants will still be able to honor your reservations. If the merchant needs to charge you a different amount, they will require a new authorization with your chip card. In many cases, you will need to let the merchant know your card number has been changed and provide them with the new number.